Harvard's endowment fund has spent around $1 billion to acquire control of an estimated 850,000 hectares of farmland around the world, making the University one of the world's largest and most geographically diverse farmland investors. 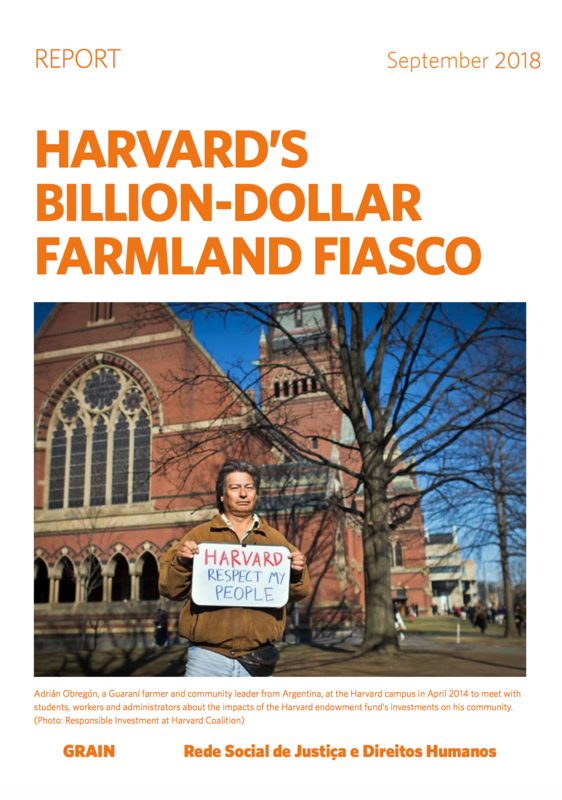 Harvard's farmland acquisitions were undertaken without proper due diligence and have contributed to the displacement and harassment of traditional communities, environmental destruction and conflicts over water. The consequences of these deals are particularly dire in Brazil, where Harvard's endowment fund has acquired nearly 300,000 hectares of land in the Cerrado, the world's most biodiverse savannah. Harvard's opaque farmland investments resulted in windfall remunerations for its fund managers and business partners but have failed as an investment strategy for the university. Ensure that affected communities are adequately compensated for damages. GRAIN is a small international non-profit organisation that works to support small farmers and social movements in their struggles for community-controlled and biodiversity-based food systems. Our support takes the form of independent research and analysis, networking at local, regional and international levels, and fostering new forms of cooperation and alliance-building. Most of our work is oriented towards, and carried out in, Africa, Asia and Latin America. A Rede Social de Justiça e Direitos Humanos é resultado da experiência de trabalho com dezenas de organizações não-governamentais e movimentos sociais.